The Islamic State militant group on Saturday claimed responsibility on Saturday for attacks that killed 127 people in Paris. In an official statement the group said its fighters strapped with suicide bombing belts and carrying machine guns carried out the attacks in various locations in the heart of the capital which were carefully studied. The group also said that attacks it carried out in Paris were a response to France’s campaign against its fighters and insults against Islam’s prophet. The attacks were reminiscent of the 2008 Mumbai terrorist attack that killed 164 people and wounded at least 308. Romania’s foreign ministry says two of its citizens died and a third was injured in the attacks in Paris. The ministry statement said the Romanian embassy was in contact with the families of the two Romanians. No details were available about where they died or who they were. Meanwhile, Minister of external affairs of India said that she talked to the Indian Ambassador in France and all confirmed that all Indians are safe. Earlier, French President Francois Hollande said that the Islamic State group orchestrated the worst attacks in France since World War II and vowed to strike back. Hollande said after an emergency security meeting Saturday that the death toll has risen to 127 in a string of near-simultaneous attacks Friday night on a concert hall, stadium and Paris cafes. He declared three days of national mourning and put the nation’s security at its highest level. French police are hunting possible accomplices of eight assailants who terrorized Paris concert-goers, cafe diners and soccer fans in this country’s deadliest peacetime attacks, a succession of explosions and shootings that cast a dark shadow over this luminous tourist destination. 8:32 pm: The department’s deputy spokesman, Mark Toner, says Saturday that “the U.S. Embassy in Paris is working around the clock to assist American citizens affected by this tragedy.” He would not comment if any were killed. 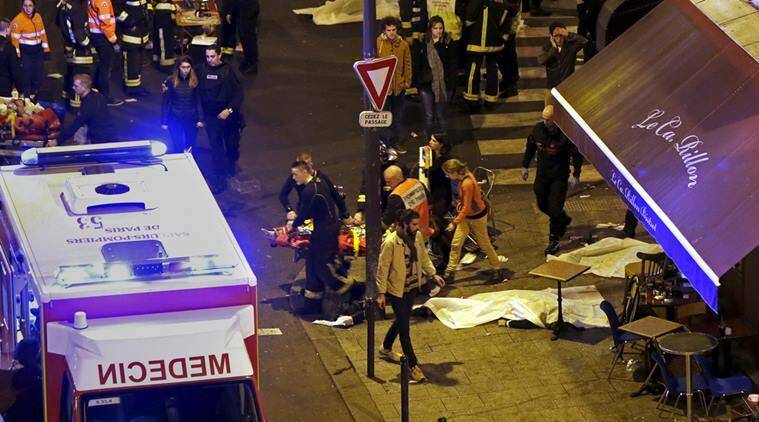 8:31 pm: A State Department spokesman confirms that Americans are among the injured in the Paris terror attacks. 8:25 pm: Police say one bomber in Paris attacks was young Frenchman flagged for links with Islamic extremism.